Redskins DB DeAngelo Hall retired after 14 seasons in the NFL. The No. 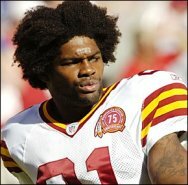 8 overall pick of the 2004 draft, Hall was a Falcon for his first four seasons, earning Pro-Bowl nods in 2005 and 2006, and had a brief and ill-fated stay with the Raiders, but he will be remembered as a Redskin. Hall spent the final 10 seasons of his career in Washington, earning an additional Pro-Bowl honor in 2010 and recording 23 interceptions from 2008-13. Injuries limited Hall to just 22 games over his final four seasons, but he still put together a quality career. Hall is reportedly mulling TV and front office job offers. the 4int game was crazy, even Cutler at QB it was an amazing feat. Hall was a really good player for us. Hopefully he stays with the team. Seems like a smart guy that could be a coach or work his way up the front office. Doug could be good mentor for him as a former player himself. There was a time where I wanted him gone - thought all he was was hype and nothing to back it up. But, he was a solid CB. Loved those times he frustrated Dez Bryant to no end. Hope he sticks around in some coaching capacity or maybe even with Redskins media. I've seen him on some sports shows, he's very well spoken. Thanks to DHall - a solid contributor and leader for the D for years. And someone who showed that whatever the knock on a player coming in (remember Meangelo? ), you can grown and develop as a leader. good luck - wouldnt be a bad guy to keep around redskins park in some capacity. Nice find from the archives! Had to go all the way back to 2010. Something a little more recent in 2012. The last time Washington won a home game at FedEx against Dallas. As others have stated very eloquently here, when the Redskins first signed D Hall I thought that he was very talented but had a caustic personality. DHall turned into a great player for the Redskins and I will miss him, but as others have said it was time for him to retire. I do hope that he does stay on with the team in some sort of coach capacity.